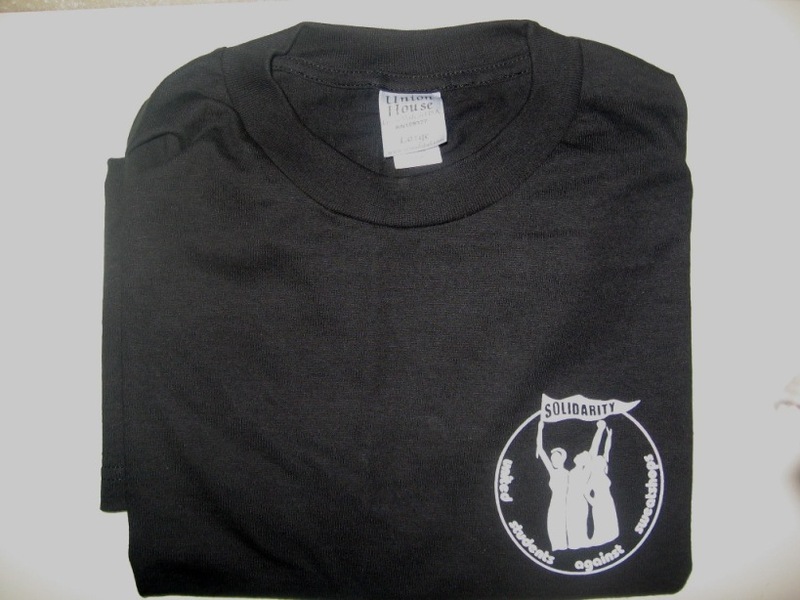 Just in time for Christmas we’ve got union made 100% cotton United Students Against Sweatshops t-shirts for sale. They come in all colors and sizes as long as it’s large and black. The front has the USAS logo and the back says “make the University of Houston sweat free.” The shirts are $15 each which includes delivery to campus or for a nominal sum we’ll arrange for a uniformed agent of the government to bring them right to your door. Contact us at uhusas (at) gmail (dot) com for ordering information. All proceeds go towards materials and expenses for our sweat free campaign. Thanks! Click on thumbnail image below to see the full size picture. Ya’ll are aware there is a worker owned cooperative screenprinting shop that prints on union made clothing in colors additional to black and sizes additional to large. Thanks Rob. We got a deal on these that’s why they’re all one size /color. We’ll check your company out next time, first we gotta sell these. Thanks for your interest.